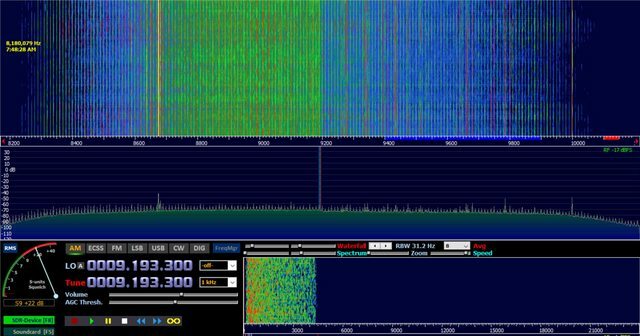 General Radio Discussion / Decoding Digital Signals - How do you ID the Signal Type? 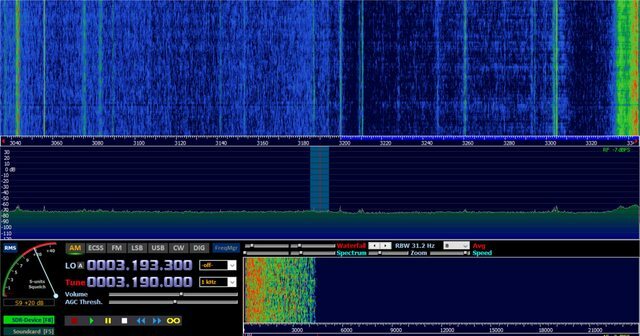 What can I use to identify digital radio signals to determine the signal type (FSK, MFSK, PSK, PSK31, STANAG 4***), then the Mode (LSB/USB), and Bandwidth to determine whether or not it is encrypted? Knowing the details of the signal is the first step in decoding. The question is for signals found outside of the amateur radio bands. UNID CW at 4870 KHZ received most mornings in Las Vegas, NV. Didn't find much on the net other than references to M89 Chinese Military. When I am able to receive this unknown CW station, Asia SW stations are also very strong. 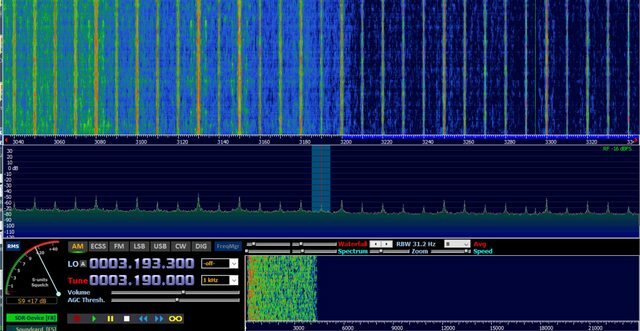 I am unable to decode the CW - can't figure out how to get HDSDR, FLDIGI, and the Virtual Audio Cable to play nice to decode anything. Something with my configuration is wrong as I can't decode anything despite being able to see it in the tools. If anyone is willing to help, I will sure appreciate it! Anyone know what/who is broadcasting CW @ 4870 KHZ? Equipment / Under The Eaves Horizontal Receive Loop or Random Wire Antenna? I plan on installing an under the eaves horizontal loop antenna for receive only. The wire is spooled so I don't know the exact length but I estimate it to be 250 - 300 feet. The wire 'mount' is a long screw to bring the wire off the wood. I wrapped the wire once around the screw to keep it taught until the next screw. 1) For a receive only loop, what is the best way to attach the coax feedline? 2) Which is better - using it as a long wire (free terminating end) or a loop (coax attached to each end)? 3) Would a dipole (terminated or not) perform better than the random length wire or not? 4) Does wrapping the wire around the screw 1 time affect performance? Looking for feedback on making this antenna efficient. I am running Windows 10 with HDSDR & FLDIGI configured with VAC 4.51. FLDIGI is configured for the VAC Line 1 and can 'see' the data streams from HDSDR when Windows 10 pipes the audio through VAC Line 1. This configuration appears to be working; however, the output of the FLDIGI decoder is gibberish. For example, CW is unreadable despite being tuned properly in HDSDR and FLDIGI. Squelch on/off doesn't matter - everything is trash. The FLDIGI decoder becomes legible only if I enable the Audio Repeater (KS) that comes with FLDIGI. When running, the FLDIGI ouput appears to be correct. Validated with WEFAX and CW. In other words, FLDIGI only works properly with the Audio Repeater (KS) running; otherwise the output is trash. I though the Audio Repeater was to pipe the audio elsewhere post FLDIGI, not into FLDIGI. Does everyone else run the Audio Repeater too? It doesn't make sense (to me) that I can see the signal in FLDIGI with and without the Audio Repeater running. Received July 1 @ 8:40 AM PT from Southern Nevada. I regularly tune unknown data signals from 5-9 MHZ (possibly higher). It sounds like HDFL (bursts of uniform 'hiss') that may or may not include anything other that the bursts. 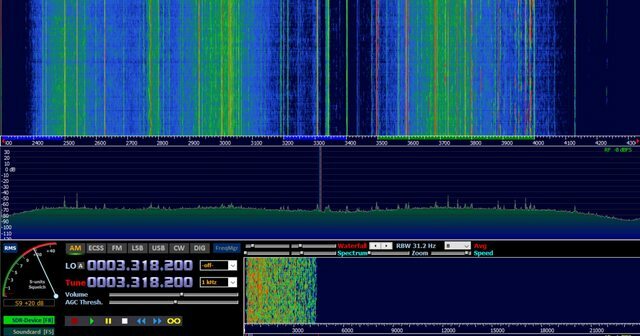 I have found a few have CW either before or after, can't tell which, but probably at the end of the transmission. The waterfall pattern width is about as wide as HFDL or STANAG. I have listened to the identified signals in the WIKI and can't narrow this down. General Radio Discussion / Rolling QRM - Grow Lights RFI? Rolling QRM. It starts fast, slows, then stops. When it stops, the interference is present for 12 hours. Some have suggested this is Grow Lights RFI. It lasts approximately 5 minutes before stabilizing, just like the ARRL states. Now ... how do I locate the source in a densely populated neighborhood? 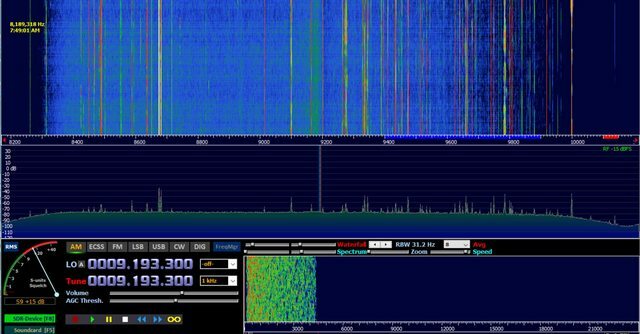 Homes, homes, everywhere ..
General Radio Discussion / Rolling QRM from 3000-10000 khz - What Is It? I was lucky to catch the QRM start this morning @ approximately 10 AM Pacific Standard time. It was wide, starting around 3000 khz up to 10000 khz. The rolling was faster before I started recording. Once it stops, it is very still with minor drift +/- and is present until approximately 10 PM Pacific Standard time. When it stops rolling, it does not start up again. It present periodically throughout the bands from 80 -> 30 meters. Before and after 10 AM/PM, it is not present anywhere that I can see. What would cause rolling QRM like this? I caught it yesterday and powered-down my house at the breaker only leaving one circuit up for the radio and switching circuits to validate whether or not it was the house. To the best of my knowledge, it is not my house but something in the environment radiating RFI. Living in Las Vegas, NV, we have a lot of solar rooftops that could perhaps contribute to this in some way. However, it lasts until 10 PM which is far past sunset. Equipment / Long Wire or Dipole for HF/SW RX? I have an opportunity to string-up either a long wire or dipole for HF and Short Wave listening. Not interested in freqs. above 20 MHZ. I can get about 140 feet of wire up in the air, either a long 140 run or two 70 foot runs as a dipole. As this is receive only, would a dipole offer any advantages over an end fed wire? Instead end fed, what about a center fed long wire? Equipment / Long/Random Wire with Twisted Pair - Untwist or Not? I am getting ready to string up another long/random wire, +100 feet. Receive only. My wire is single pairs from a CAT5 spool (eight wires - four pairs). The individual pairs are twisted together. If I understand, the potential for the electromagnetic fields to cancel out by the equal and opposite currents (in each wire) is probable as a result of the twist. The purpose of the twist is to keep it from radiating or receiving, correct? For the antenna, would it be better to separate the pair - leaving a single wire? Would connecting both ends, effectively making a twisted flat loop, provide a positive or negative result for receiving? Would this be connecting the pairs in parallel or series? The cable is good and I want to get the best out of it.